^ Dinello, Daniel (2005). Technophobia! : Science Fiction Visions of Posthuman Technology. University of Texas Press. p. 77. ISBN 9780292709867. Carpenter, J., Davis, J., Erwin‐Stewart, N. Lee. T., Bransford, J. & Vye, N.（2009）. 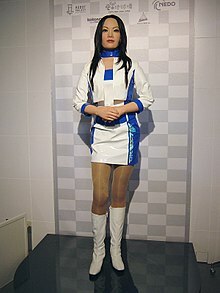 Gender representation in humanoid robots for domestic use. [International Journal of Social Robotics（special issue）]. The Netherlands: Springer. Jon Stratton, The desirable body: cultural fetishism and the erotics of consumption, University of Illinois Press, 2001, ISBN 9780252069512. Patricia Melzer, Alien Constructions: Science Fiction and Feminist Thought, University of Texas Press, 2006, ISBN 9780292713079. Stratton, Jon (2001). The desirable body: cultural fetishism and the erotics of consumption. US: University of Illinois Press. ISBN 9780252069512.